Cybil is senior shelter dog with clinical signs consistent with osteoarthritis. She was treated with acupuncture and had a positive result with improvements in mobility and mentation. 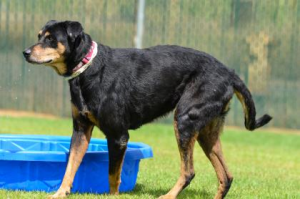 Cybil is an approximately 7 year-old female spayed shepherd mix that has been suffering from osteoarthritis. Her history is unknown since she was brought to the shelter as a stray. When found as a stray she was unable to walk or stand up, however when she arrived at the clinic she was able to walk although it was a stiff gait. She was being treated with 50 milligrams of carprofen twice daily. On presentation, Cybil was bright, alert and responsive. She was thin with a BCS of 3/9. She walked with a stiff gait and shortened stride, especially in the hind end. Her gluteal muscles were atrophied. On myofascial palpation, pain was elicited on thoracolumbar and lumbosacral palpation. She had decreased mobility in her hip, especially in extension. No pain or crepitus were found on stifle flexion or extension. In addition, trigger points were found in neck, shoulders, and triceps bilaterally. No pain or crepitus were found on orthopedic exam of the forelimbs. Also, patchy alopecia was present that was suspicious of allergies. All other aspects of physical examination were within normal limits. Based on physical exam and myofacial palpation, acupuncture points that provided neuromodulation to the pelvic limbs, thoracolumbar and lumbosacral regions were chosen. Neuromodulation to these regions will provide anti-inflammatory effects and increased blood flow thus promoting healing and analgesia. In addition, trigger point deactivation was indicated. Differential diagnoses include osteoarthritis of the hips, thoracolumbar and lumbosacral regions. Another differential for pain along the bladder line include visceral pain or pathology. In addition, allergic dermatitis (atopy) was suspected. Radiographs would be indicated to confirm the diagnosis of osteoarthritis. However, radiographs were not available at the shelter. In addition, a senior profile (complete blood count and serum chemistry) would be indicated to rule out other differentials but this was not available at the shelter as well. Based on physical exam, signalment and history, osteoarthritis of the hips, thoracolumbar, and lumbosacral regions are most likely. In addition, allergic dermatitis is highly suspected. The patient was on flea prevention, and skin scraping and Wood’s lamp exams were negative. Therefore, flea allergy dermatitis, ectoparasites, and dermatophytosis are lower on the differential list. At this point, the patient became a little bothered and did not like it when it was attempted to insert more needles. I would have liked to do more peripheral points, trigger point deactivation, and points for allergy treatment (ie. LU 7). The patient showed her limits and instead the trigger points in her neck and forelimbs were massaged while the needles were in place. Ideally laser therapy could have been used to treat these trigger points, but laser therapy was not available. After about 30 minutes of having the needles in place, the patient perked up, was brighter, and became more active in the treatment area. These positive signs marked the end of treatment and the needles were removed. The patient was only treated once a week and treatment was terminated due to the patient being adopted. Further acupuncture treatment including electroacupuncture would be very beneficial for this patient. According to the veterinary technicians, volunteers, and kennel staff at the shelter, Cybil was perkier and ambulated easier after acupuncture treatment. Because Cybil had been on carprofen prior to and after treatment, the positive outcome could not only be attributed to acupuncture. However, Cybil had been on carprofen for a couple of weeks before acupuncture treatment and these improvements in mobility and mentation were not noted until after acupuncture treatment was performed. Cybil’s case is an example of how beneficial acupuncture can be in patients with osteoarthritis. Osteoarthritis is very prevalent in our veterinary patients and many different medications are available for treatment. However, because many of the patients with arthritis are older and often have concurrent illnesses, acupuncture really is a vital modality that should be added to the treatment plan. Morgan, R. V., DVM, DACVIM, DACVO. (2016). Degenerative Joint Disease. Robinson, N. G., DO, DVM, MS, FAAMA. (2016). Medical Acupuncture for Veterinarians: Canine Point Manual. Thermographic evaluation for the efficacy of acupuncture on induced chronic arthritis in the dog. (2005). The Journal of Veterinary Medical Science, 67(12).